For many, when the words “poet’s society” come to mind, an image of a group of teenage boys reading poetry to each other in a cave or being taught by Robin Williams may appear. Unlike the boys of Welton Academy in Dead Poets Society, the UT’s Poet’s Society is no secret, and very much alive. UT has a few organizations for creative writers such as Sigma Tau Delta (STD) and Neon, but the Poet’s Society seeks to carve out a space solely for, well, poets. Students now have a place where they can share their love for poetry with others. 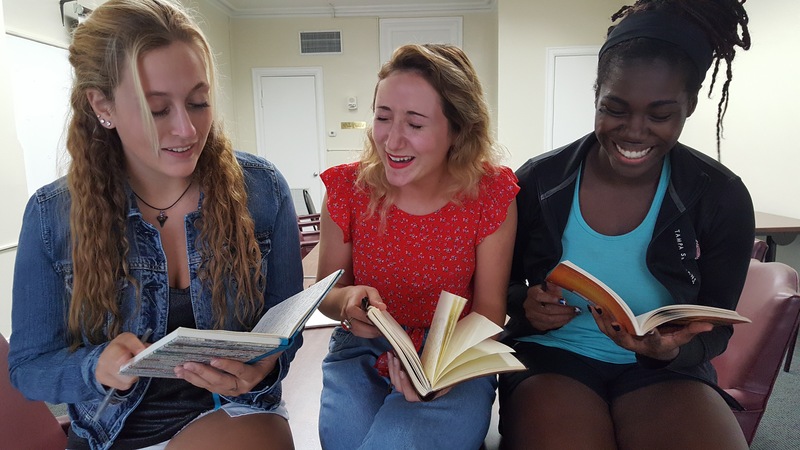 The idea for a poet’s society came from one student’s love for poetry and a desire to provide a community where other poets could be comfortable expressing themselves. Junior psychology and public health major Victoria Sunseri, founder and president of the club, wanted to provide a safe community where members are encouraged to share and develop their skills. Aside from their biweekly meetings, the organization puts together events to help their members grow as writers. Award-winning poet and UT English professor Erica Dawson, is set to workshop with the club this semester to help with the editing, revision and feedback process in preparation for their open mic night on Dec. 2 at Old Tampa Book Company. They will also be attending open mic nights at Tre Amici at the Bunker every first Friday of the month in order to help members get comfortable sharing their work. Long Island award-winning poet Terri Muuss will also be coming to workshop next semester. There is no specific criteria to be a part of the Poet’s Society, which is open to students of all majors and interests. They currently have about 15 members in the club and are continuously welcoming new members. The club is also a good outlet and sort of therapy to help relieve stress, according to senior psychology major, Jabria Lewis, co-president of the Poet’s Society. She said she feels there was a lack of writing organizations for those who aren’t writing majors and feels that the Society is a good way to expand on one’s abilities. Faculty advisor Dr. Caroline Hovanec also sees a good future for the organization and said she feels Poet’s Society will be a beneficial contributing factor to the “creative scene” on campus. “We have a lot of students at UT who are really creative and passionate about art, literature and poetry, and the Poet’s Society offers a great opportunity for them to meet each other, share their work, and find out about arts events on and off campus,” Hovanec said. Meetings are every other Thursday in Plant Hall 327. The next meeting is Oct. 20 at 8 p.m.